Raise your hand if you work in a Marzano district. Raise your hand if you work in a district that does formal teacher observations. Raise your hand if you are required at some level to track where your students are on standards. My hand is raised for all of those and I’m sure a lot of your hands were raised, too. Part of any teacher’s role these days is to track standards-based student performance (Marzano Element 2). Effective teachers know that it’s more than just standing up and teaching now. Rigorous teaching requires monitoring and tracking of student progress in order to drive our instruction. In a classroom of 22+ kids, it is darn near impossible for me to track every student’s performance on any of the 2-4 standards I am teaching during any given class period. I needed something quick and efficient to help me out. I made a modified, much simpler version of ClassMax to use on my own iPad during instruction last year in my classroom and began to use that as I taught. Whenever my administrators came into my classroom and saw me tracking progress instantly on every student, I always earned either an Effective or Innovating score in the area of tracking student progress. This was the central need that led me to create ClassMax. 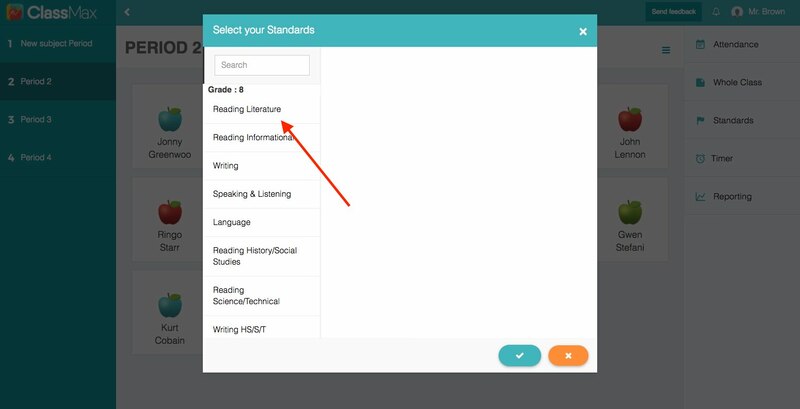 At the start of your school day, you go into the standards area on the sidebar of the dashboard and select the standards you are teaching for the day. Standards are now Common Core, but individual state standards will continue to be added as the school year goes on. Once you have selected the standards you are planning to teach that day in class, those standards are saved and will appear every time you call up a student profile that day. The standards reset at midnight so that you begin the next school day with a clean slate. This is when the tracking component comes into play. You know all those times as a teacher when we are circulating the room, observing, listening, and assisting students? That’s when you are using ClassMax. I carried my iPad, phone, or even my laptop some days around the room with me as I circulated and marked students as I went. I could mark every student on a particular standard in under 2 minutes. It was incredible. And it made the most of my class time, too. These days, as classrooms become more student-driven, teachers often feel a little like drifters, floating around the room, waiting for someone who needs our help. With ClassMax, I was not only maximizing my student’s time in the classroom, but I was maximizing my own time in the classroom, too. Now, I was actually taking the time to track student progression that I observed, not just what they were able to perform on an assessment. ClassMax even gives you a little note box so that you can write any observations you make or want to remember later. I didn’t always use these (especially if time was limited), but it is helpful for when you are reflecting on your teaching (Marzano Domain 3)! Be sure to mention that in your post-conference with your administrator!). One step that our ClassMax team developed after I showed them my prototype was in adding the grouping feature to this tracking. Let’s say I observe a group that is really rocking something – or maybe is struggling. 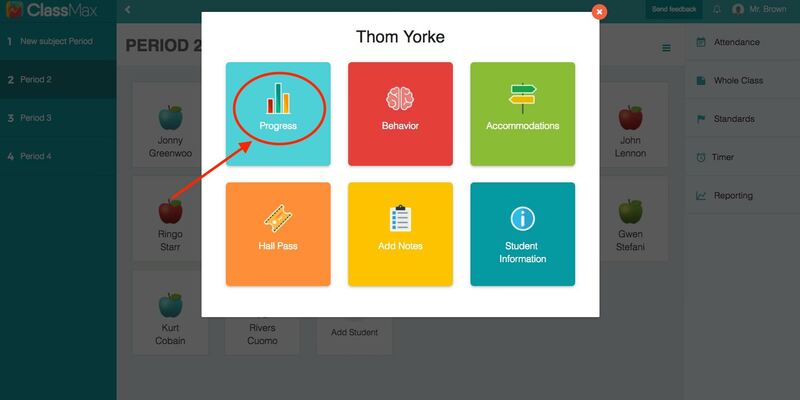 I can save myself time by selecting their group from the dashboard and I can assign their progress tracking to the entire group, instead of having to do this one student at a time. And if you use this information later to form groups, that’s another Marzano element for grouping strategies (Element 15)! When I am planning my next lesson or looking ahead to differentiate instruction (let’s see how many buzz words I can use in one blog post, shall we? ), I simply run a report and I can see all the standards tracking that I have done for a student. ClassMax doesn’t invent new ways to be an effective teacher. Instead, it takes what we are already doing in rigorous, effective classrooms all over the country and streamlines the process so that within three simple clicks, we are able to better serve our students. Best wishes for a wonderful school year, teacher friends! 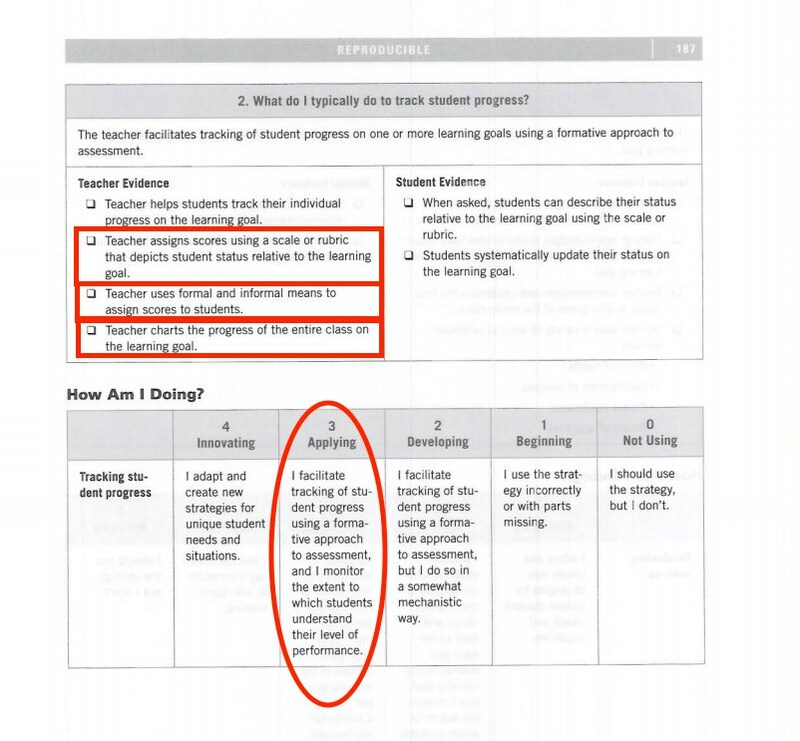 This entry was posted in Progress Monitoring and tagged Marzano, teachers, tracking student progress. Can’t wait until you’re able to include Indiana standards, Mrs. Brown. This sounds terrific! You’re in luck! In addition to Common Core Standards, you’ll be able to upload your own custom (Indiana) standards in just a few moments! Can you enter past assessments?